The “blood rim” is made from the same kind of mixture as you’d use to make hard candy. It’s actually pretty easy, but you will need a candy thermometer (which you can find at most grocery stores). Turn off heat. 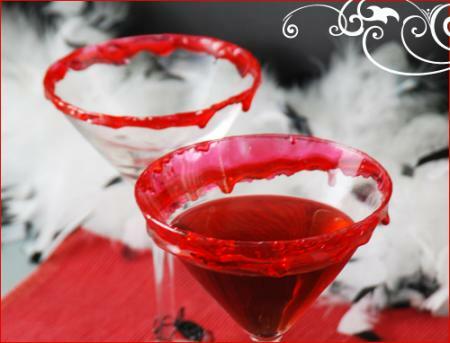 While the mixture is still hot, dunk the top of the cocktail glass into the mixture to create the red rim. If you need to do several glasses, keep the mixture hot so it lasts longer (instead of turning heat off, just reduce slightly).You can go anywhere from just along the very tip of the rim to part way down the glass – whichever you prefer. Flip the glass right side up to cool. The thick consistency of the mixture will cause “drips” as it hardens on the glass! My question is, if I use the plastic martini glasses, will they melt? For the last two years, I’ve made Halloween cupcakes for the party. I’ve gotten lots of votes for them, but I don’t end up winning. 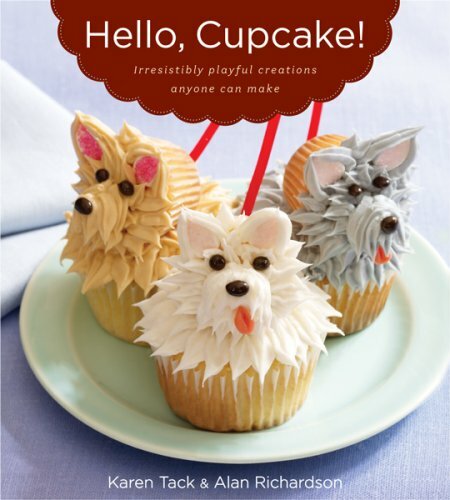 This book, Hello, Cupcake! has lots of ideas for cool cupcakes to bring to the party, but I don’t think I’m going that route this year. 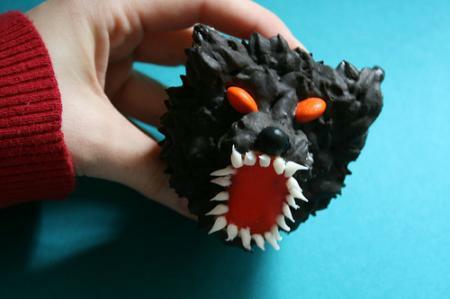 Tofu and Cupcakes » Blog Archive » Werewolf Cupcake from Hello, Cupcake! The werewolf got rave reviews…but I can tell you that the ones from the book look 100% better than mine! I should have gone with a stiffer icing (like Swiss meringue buttercream), I used Hershey’s “Perfectly Dark” chocolate buttercream. The book detailed a method of the “fur technique” using a regular ziplock bag as a pastry bag. They even used two-toned frosting on theirs. Considering how steep the competition is every year for the potluck award, maybe I should put a little more effort into my costume instead. Check out this video of one guy doing Thriller all by himself. In what seems like a miraculous coincidence, a standard LED fits exactly into the head of a Lego minifigure. It’s that easy: grab an LED and a head, slip it in, and it fits perfectly. 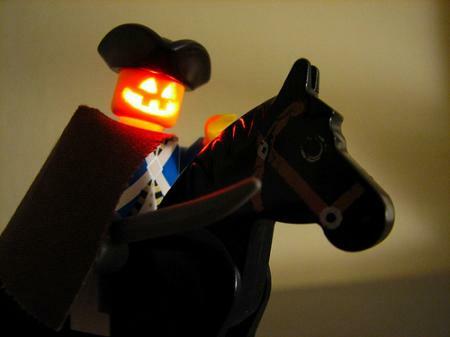 I love those Halloween dioramas that they sell at Michaels Arts and Crafts, but a diorama made entirely of ghostly Lego minifigs is FAR more cool! This craft project is truly awesome on so many levels that I am blushing at its greatness! 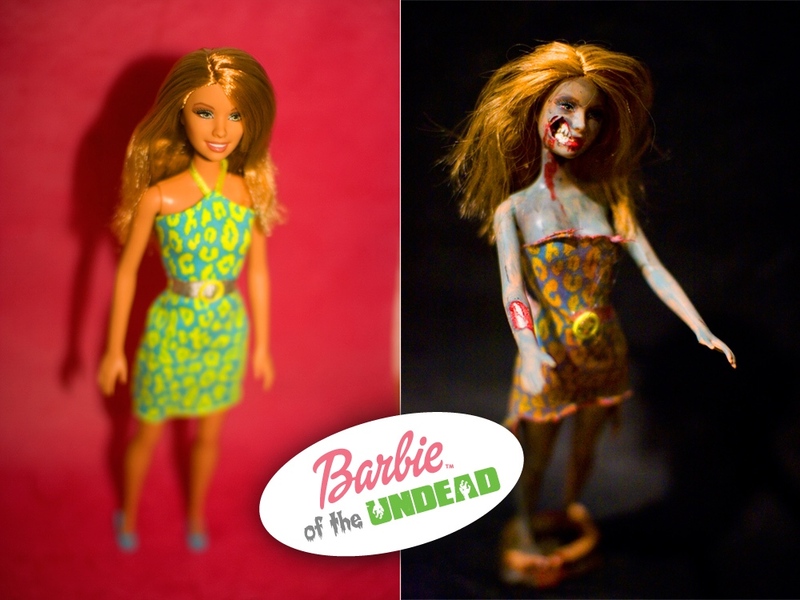 If you want to make your own Barbie of the Undead, you’ll have to fine tune your Sculptey Skillz, but it’s totally worth it! 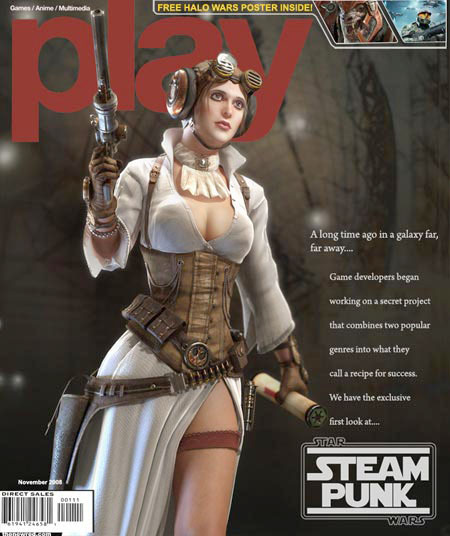 The idea of steam punking Princess Leia is truly awesome. 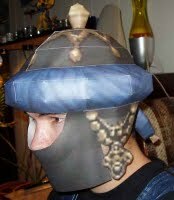 I don’t think I’ll make a costume like this, but it’s definitely something that I can use for ideas. 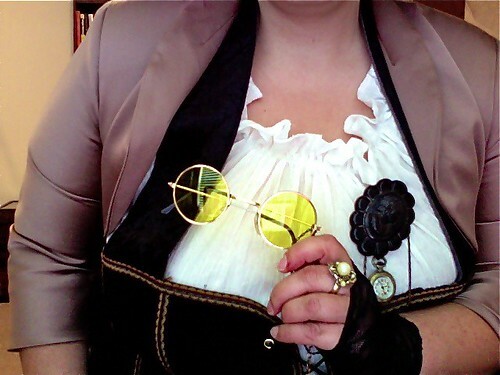 Today, the third installment of The Dowager Moncur’s Spectacles has posted on Steampunk Stories. The Dowager Moncur’s Spectacles: A Hard Day in America (Part 3 of 5) – Steampunk Stories: In which the Dowager Moncur reveals her true madness to Miss Isabella Davenforth. Threadbanger has a detailed tutorial about how to make steampunk clothes. More ideas for my steampunk costume. When I was a kid, my dad would never let me get these cereals, so every year when they become available, I buy a box. 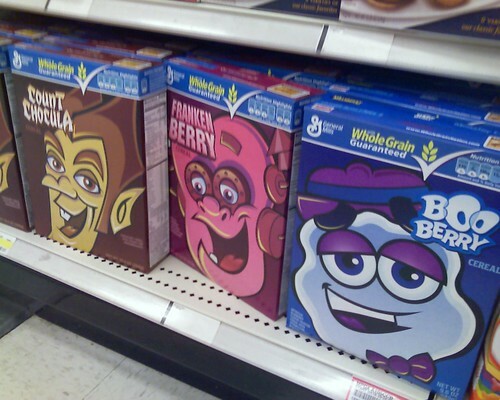 Of course, my tastes have changed and I can’t stomach Count Chocula anymore. I usually have one bowl for dessert one evening and the rest is eaten by Kristen when she visits. The last third of the box is usually thrown away some time in April when I realize that it’s too stale to eat. 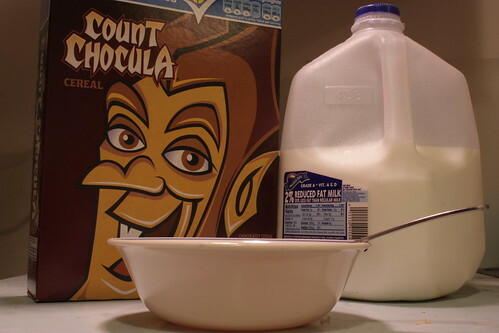 Here’s to buying another box of Count Chocula again this year! 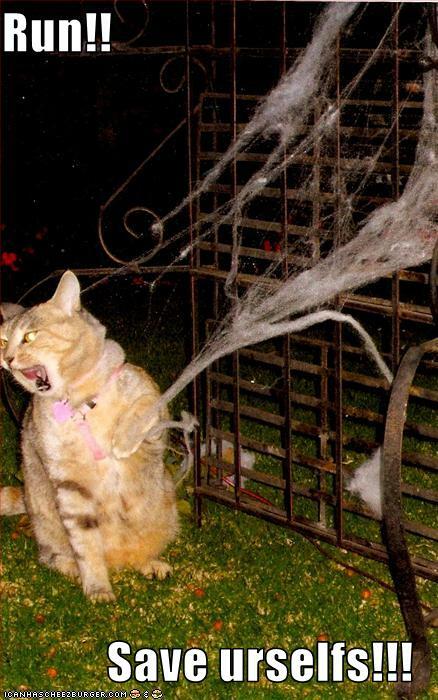 I’ve never seen a cat get caught in Halloween cobwebs, so this made me laugh! I love this filler art done by Randy K. Milholland based on Edgar Allen Poe’s The Raven. Back in April, he had attended RavenCon, so he did some art in honor of that, but it’s a great picture for Halloween as well! Back then, I said that I had never seen a raven. Since then, I have and I was right. They just look like HUGE crows. I kind of expected them to be smarter than crows, but the ones I saw acted just like them. something positive: Hello New Victim! 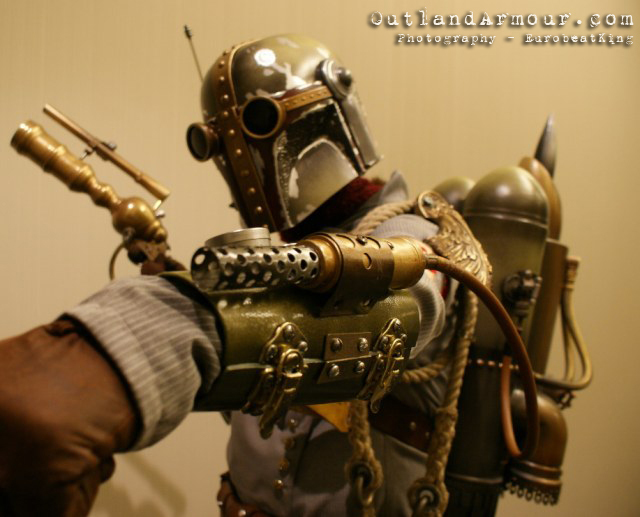 Today, the fourth installment of The Dowager Moncur’s Spectacles has posted on Steampunk Stories. 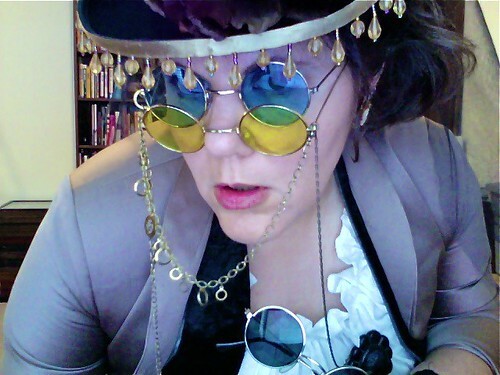 The Dowager Moncur’s Spectacles: American Notes (Part 4 of 5) – Steampunk Stories: In which Isabella Davenforth brings forth two volumes of stories to the Dowager Moncur. I’ve been reading Edmund Finney’s Quest to Find the Meaning of Life for a while now. 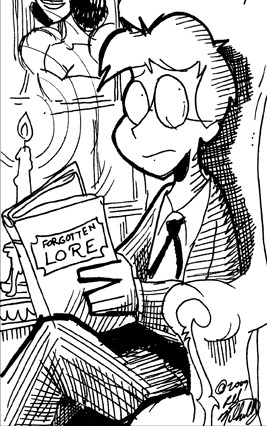 When the comic first started, however, Edmund found himself in a place called Fearville, where every day is Halloween. The thought of Halloween every day is so tiring to me. I do so much for Halloween that celebrating it every day would be impossible. I would have to tone things down and do a little costuming each day. It would be exhausting and I would soon be VERY sick of it. It reminds me of a quote from Shakespeare. 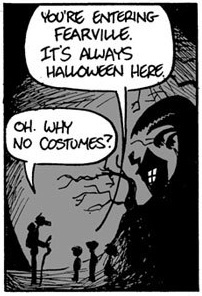 I think I’m happy to live in a world where Halloween only comes one day a year. It would be nice if I could somehow find a society where Christmas is only one day a year instead of THREE months. 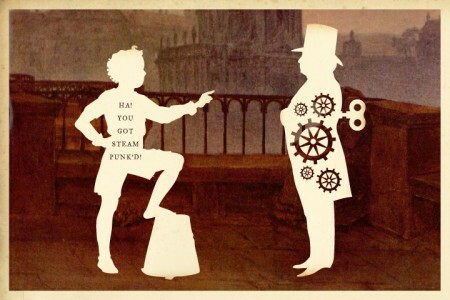 Silhouette Masterpiece Theatre: You Got Steam-Punk’d! Here is a playlist showing Disney’s Halloween Treat. It was a TV special that first aired in 1982. I love to watch things like this during the Halloween season. 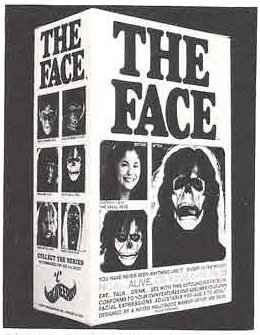 I don’t know if television still makes specials like this for the holidays. Maybe I should check the TV listings to see if there is anything like this for the kids of today. I like to do papercraft and if there is a cool way to easily add to your costume without using a lot of money, papercraft is the way to go. You don’t have to be into Final Fantasy to enjoy the cool awesomeness of this, so here is a great way to do a costume on the cheap. Cracker Jack for Halloween Treats?! I saw this old advertisement and I became SO jealous of kids from the fifties. 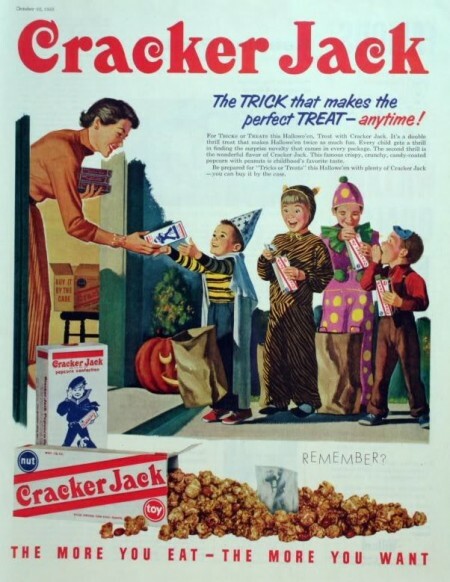 Can you imagine getting an ENTIRE box of Crackerjack at a house for Halloween?! That seems like WAY more than my fantasies of what Halloween was like. 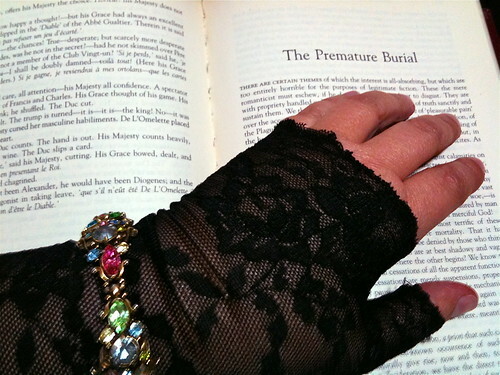 Today, the final installment of The Dowager Moncur’s Spectacles has posted on Steampunk Stories. The Dowager Moncur’s Spectacles: What the Dowager Moncur Told Isabella (Part 5 of 5) – Steampunk Stories: In which the Dowager Moncur finally reveals to our brave heroine about her curious spectacles. Since I wrote an entire story about my Halloween costume, you can imagine how excited I am for the party this Saturday! I hope it goes well! When I think of steampunk and the marriage of machines and Victorian sensibilities, this steampunk spider walker fits right in! 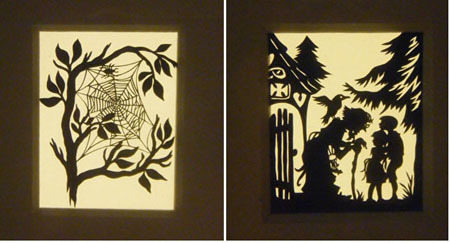 Margaret Oomen over at resurrection fern visited the Musee des Miniatures in December last year and took photos of these creepy papercuts. You have to see them in person to believe just how tiny they are. Some are no larger than postage stamps or small coins. 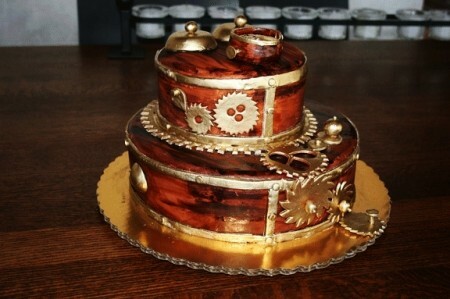 We have the incredible Boxborough bakers, Babycakes, to thank for the inspiration for this beautiful Steampunk Cake. 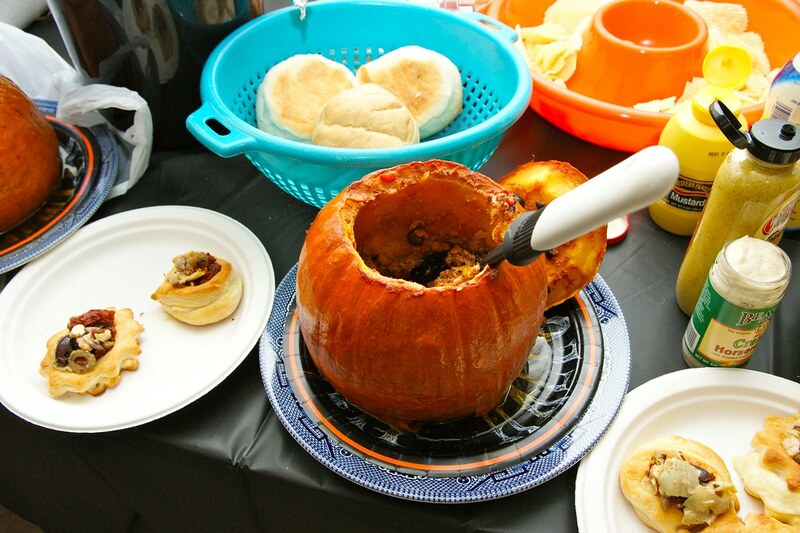 Every year, I obsess about the potluck competition of the Halloween party, but this cake is FAR out of my league. I might be able to hire a bakery to replicate this for me, but there is no way I could achieve this on my own. 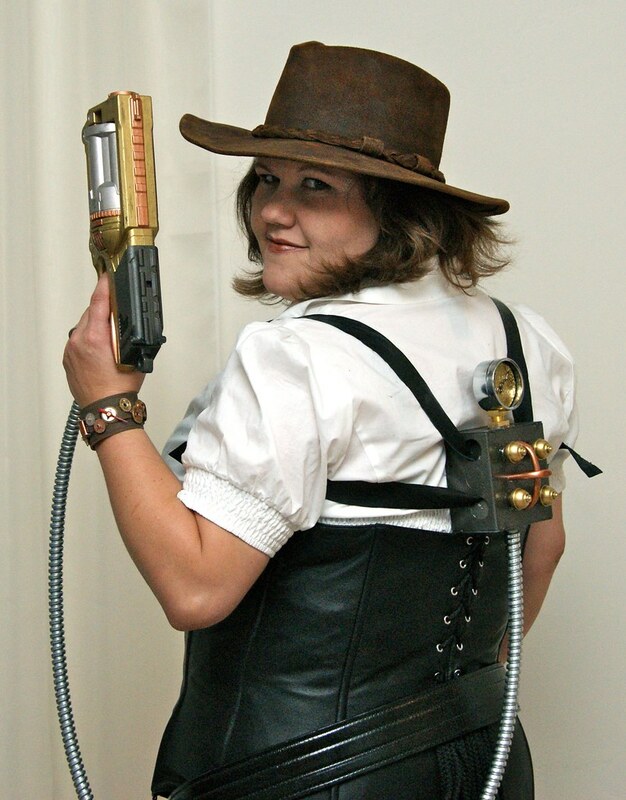 The truly excellent ‍Meggrs created this awesome steampunk iPhone case for her steampunk costume. It’s basically a balsa wood keepsake box from a craft store which I then cut a hole in the front (with a Dremel) for the screen, sanded, stained with oil-based stain, varnished and attached brass hinges and corners from the craft store with screws and glue. The buttons and speaker cover are brass washers from Home Depot. 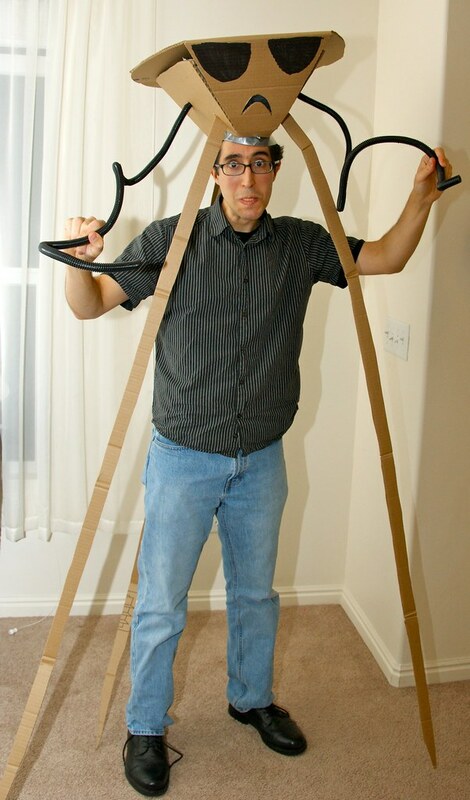 I’m tempted to try this hack for my own costume because it’s THAT awesome! I especially love the loop for hanging on a belt clip. I can’t believe how much I love this Recyclobot Costume from Mother Rising. He took his Recyclobot for a spin at a Halloween party at our local community center and he made quite a scene. Children circled around him trying to get a closer look, and parents were taking photos. 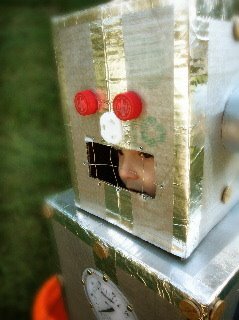 I could hear him inside saying, “I’m not a real robot…I’m just pretending”. Not pictured, she also had dryer tubing for his arms. It was even better in real life because she used some LEDs under the bottle cap eyes to make them glow. The tiny LED lights can be found in the wedding section at Michaels and are often used to illuminate balloons. If you can’t find them at Michael’s, then you can buy them here for 18 bucks a bag. They have three settings: constant on, slow blink and fast blink. 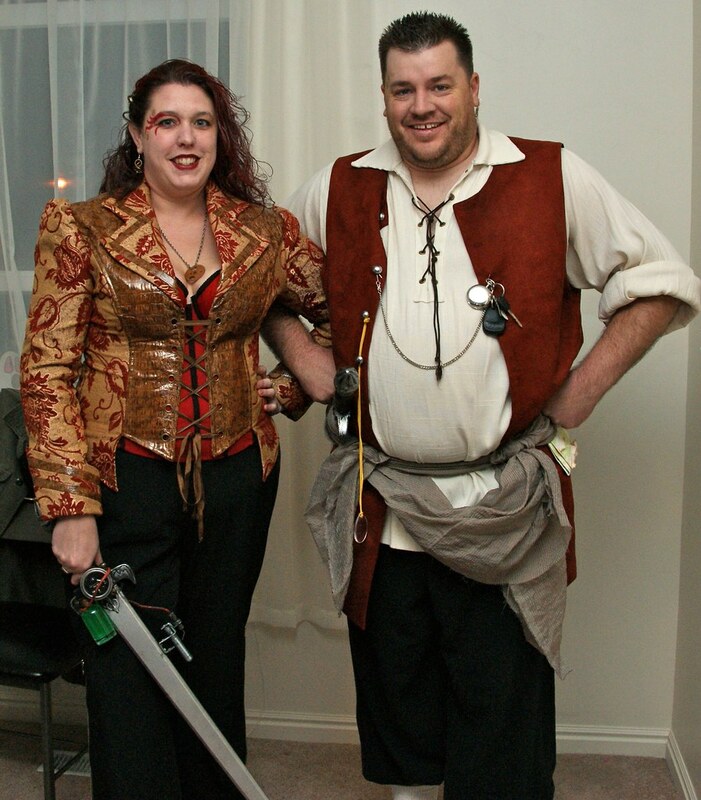 They last for approximately 8 hours on a button battery, so that’s plenty of time to last for a Halloween party. I had never heard of balloon lights before I read this entry, so I’m excited about all the things you could do with them. High tech costuming just got a WHOLE lot easier! Imagine being able to make yourself a positronic brain just like Data in Star Trek. 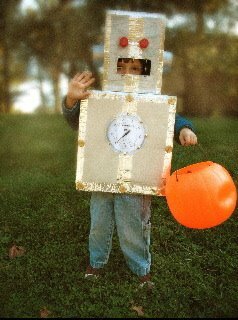 When I first looked at this costume, it just looked like a normal kid’s robot costume, but when I heard about those balloon lights, my whole life shifted just a little. 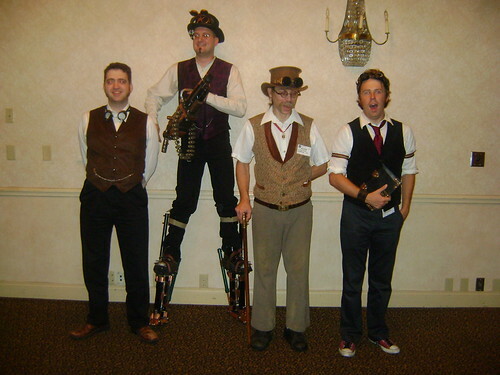 I absolutely love the steampunk stilts made by Improbcat from the Pi Convention last August. 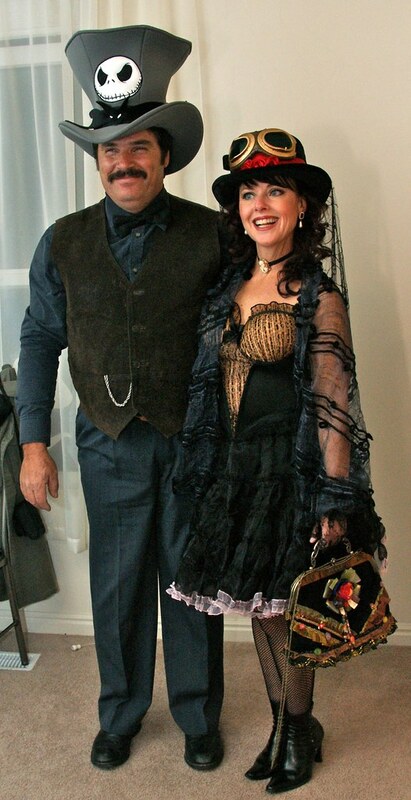 It almost makes me want to take a trip to Pioneer Valley, Massachusetts just to see all the costumes! 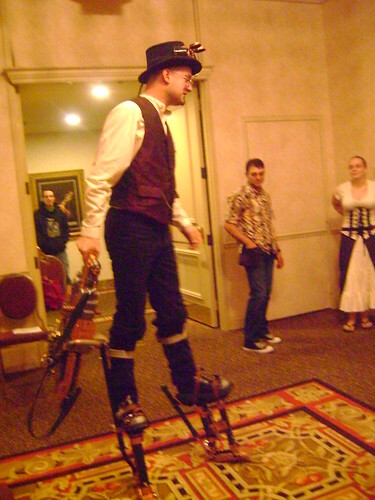 The benefit of being so much taller than everyone else is really appealing to me because I’m pretty short, even for a girl, but the thought of balancing on stilts for an entire convention or even the Halloween party sounds like a nightmare. Honestly, the entire group looks awesome! 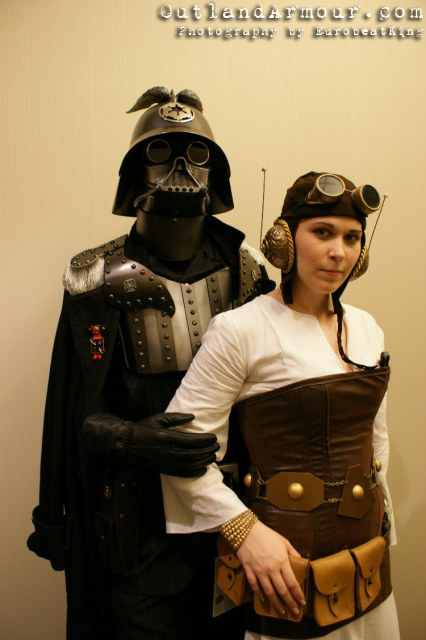 Great work on costuming, people! Keep it up! In the end, we had to hide the bat in the pantry until the night of the party because Elvis spent all his time meowing at it. 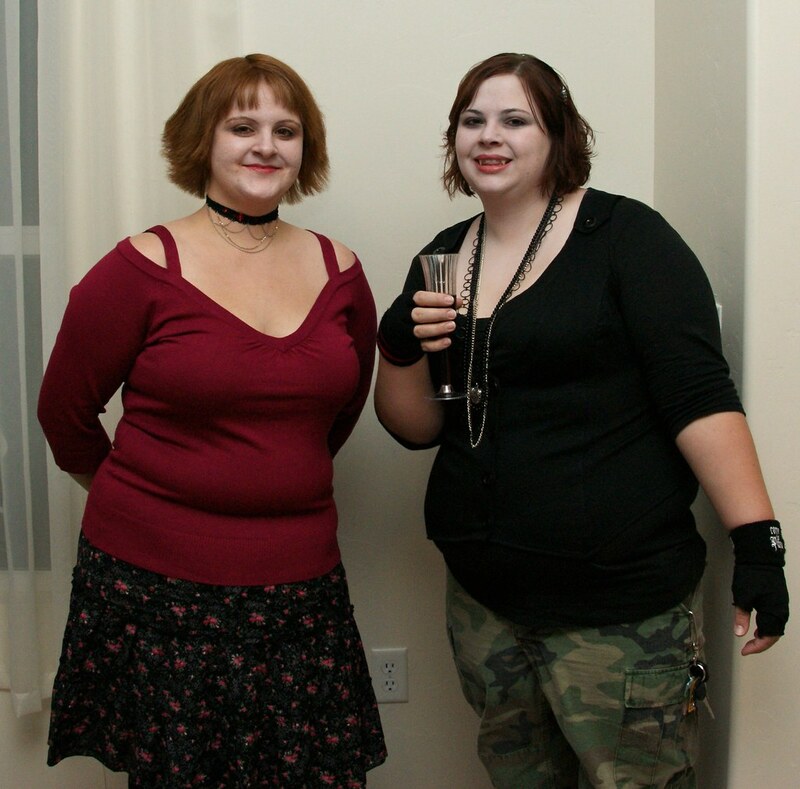 The Halloween Party was a blast! Everyone did such a good job on their costumes. Mike and I were totally blown away. 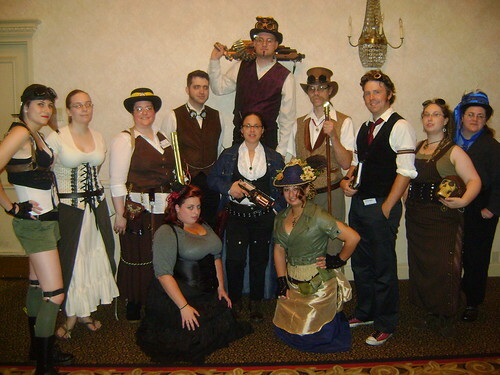 This year’s theme was steampunk and more people followed the theme than ever before! Stacey did an excellent job and this photo of her was the best! I’m always panicked before the Halloween party, worried that no one will show up. Every guest that arrives makes me happier and happier until I get to a strangely giddy state of intoxication that has NOTHING to do with alcohol. It was a great party this year and I’m so glad we were all able to enjoy it together.